The Disney Ice Castle Dollhouse by KidKraft is perfect for children who want to re-live the exciting scenes from Frozen with Ana, Elsa, Olaf, and the rest of their favorite characters. Is there more than one princess in the family? The Disney Ice Castle Dollhouse is large enough for multiple children to share in the fun and let their imaginations run wild. Everyone has plenty of space to recreate their favorite scenes with four rooms of play, all crafted with beautifully themed artwork from their favorite movie. This dollhouse has more than beautifully designed rooms of magic, the Ice Castle includes 11 pieces of custom furniture that fit perfectly into this magical world of make-believe! All furniture is crafted with beautiful, regal detail taken right from the magical kingdom! Let the music begin! Our Lil’ Symphony Band in a Box puts four fun musical instruments into one convenient package. Includes 2 cymbals, 1 recorder and 1 tambourine. Made of composite wood materials. 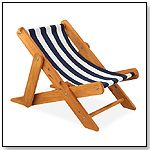 It's fun to stretch out and relax in the KidKraft Outdoor Sling Lounger with Navy Stripe Fabric. This comfortable chair is perfect for sitting on the front or back porch after a long day of playing. The KidKraft Outdoor Sling Lounger with Navy Stripe Fabric features: Smart, sturdy, all-wood construction; Weather-resistant paint to keep color vibrant; Detailed, step-by-step assembly instructions. — Helen Ulrich, sales clerk at Hardware Toys in Paoli, Pa., told TDmonthly in a June 2014 survey that children's canvas chairs are their best-selling furniture. Offering style and storage, this KidKraft Limited Edition Toy Box has a large, generous space for organizing toys, games, and books. The flip-top lid has a secure safety hinge to protect kids' fingers from getting caught. With a gracefully arched back, it's sturdy enough to double as a bench for extra seating. — Phil Wrzesinski, owner of Toy House and Baby Too in Jackson, Miss., told TDmonthly in a June 2013 survey that their best-selling furniture item is the Kidkraft Limited Ed. Toy Box. They sell "typically 24-30 a year, half of which is in November-December," he said. Our Cupcake Stand with Cupcakes is a perfect kitchen accessory for any young chefs. ids will love putting the cupcakes on display for the whole world to see. 6 pretend cupcakes – mix and match the tops and bottoms to make new color combinations. Made of composite wood products. Our bucket top mountain train set lets kids explore an entire world. When playtime is finished, storing this train set is a breeze – everything comes packaged in a convenient bucket. Molded mountain with two waterfalls and a lake – mountain doubles as the lid of the bucket the train set comes in. 61 pieces include fire truck and police station; airport with helicopter, helipad, airplane, and runway; townspeople, trees, and other accessories. Compatible with Thomas & Friends® wooden train sets and Brio® smart, sturdy construction. Our Deluxe Townhouse allows young girls to play and explore in a whole new world without leaving the house. This adorable wooden dollhouse comes with 30 accessory pieces and makes a great gift for any occasion. It’s so much fun to play interior decorator and move the different furniture pieces from room to room. Features include: 27 pieces of furniture & 3 mini dolls; Folds up for easy storage; Outdoor patio area; 3 levels and 12 rooms of open space; Vivid, detailed backgrounds; Made of composite wood materials; Packaged with detailed, step-by-step assembly instructions; No assembly required. — Isaac Judd from Magic Beans in Brookline, Mass., told TDmonthly in a June 2013 survey that they usually sell one of these houses during the holidays. The Savannah Dollhouse is an elegant, large six-room mansion designed for children ages three and up. The dollhouse is decorated like a true southern mansion and is fully furnished, with beautiful, handcrafted wood furniture. With four levels and six rooms of open space, the Savannah Dollhouse is decorated in a southern style, and includes wide-open windows for easy visibility into the rooms from outside the house. The Savannah Dollhouse fits any 12-inch fashion doll. There are 14 pieces of handcrafted, hand-assembled, and hand-painted wood furniture included with the house to furnish the six rooms. The beds have actual linens, while the couch and love seat come complete with cushions. — In a May 2012 survey, Mary Horne, owner of J. Christopher Toys in Jonesboro, Ark., told TDmonthly about the Savannah that she sells "upwards of 20 during the holiday season, but it's only a holiday item." 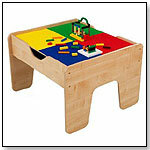 This table features a double-sided play board with a storage area underneath. It is large enough for multiple children to play at once, and comes complete with 200 blocks and a train set. — As of August 2010, this product had 3.5 out of 5 stars from 14 reviews on Amazon.com. PROS: Entertaining, well-made and easy to assemble. CONS: In order to reach the storage area, children must lift the tabletop building area. Some parents complained that the table boards do not fit well with LEGO parts. This wooden kitchen set includes a refrigerator, dishwasher, oven, microwave and washing machine doors, all with doors that open and close. The sink is removable for easy cleaning. This wooden outdoor table comes with four stackable chairs for easy storage. The reinforced wooden panels are designed to prevent warping and weathering, and the umbrella keeps kids in the shade and out of the hot sun. 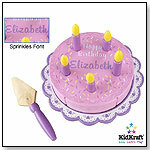 Kids can personalize this wooden cake with any name up to 12 characters. The set includes a serving tray, a serving knife, four slices of cake and four candles. 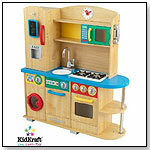 This kitchen measures 35" x 35.7" x 11.7" and features sturdy wood construction with doors that open and close. It includes a storage area, ladle, pot, "cordless phone," sink and microwave. A wide base and low center of gravity are utilized to make this sturdy wooden step stool easy to use and safe from tipping over. The top flips open on heavy-duty, no-pinch hinges for a little extra storage that is easy for kids to reach and access. ― “KidKraft natural wooden furniture, the Step 'N Store,” said Sandy Challinor, owner of Owl's Nest Toy Store in Southlake, Texas, when asked about her best-selling furniture during a May 2010 survey. — In a May 2012 survey, Donna Frederick, owner of The Play House Toy Store in Durham, N.C., told TDmonthly that they sell 2-3 step stools each month. "This is a big first year birthday present," she explained. Constructed of sturdy wood with bright primary colors, this kitchen island comes with four major appliances and accessories. 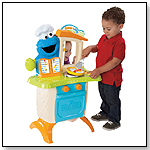 Multiple children can play together, sharing pretend household tasks at the stove, microwave, sink and oven. Turning nobs, opening doors, shakers and utensils add to the fun. ― “We do well with KidKraft kitchens and playhouses. We sell them year-round and offer free assembly,” said Shawntá Ray, owner of Happy Up Inc in Edwardsville, Ill., when asked about her best-selling furniture and playhouse items during a May 2010 survey. ― Four of 48 retailers told TDmonthly in spring 2010 that KidKraft is a best-selling playhouse and furniture brand in their stores. This fully furnished designer dollhouse has three levels of play with two curved stairways. It includes eleven pieces of furniture and accomodates fashion dolls up to 11.5" tall. With this 4 x4 sandbox, kids get to dig for treasure and build sand castles in their own backyard. 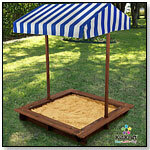 This sandbox is made of weather-resistant wood and comes with a mesh cover that protects the sand in inclement weather. The shady canopy helps keep kids in the shade and out of the hot sun and the sandbox is large enough that multiple children can play at once. Reinforced wooden panels prevent warping and weathering. Launch date: 2010. 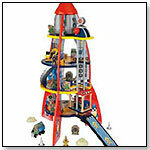 Kids can explore space with this multi-level rocket ship play set. 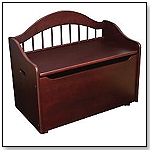 Dimensions: 23.74" x 15.67" x 29.21"
With sturdy all-wood construction and a dark cherry finish, this chest provides not only ample storage space but also utility as a bench when the lid is closed. Safety hinges are designed to protect little fingers from being pinched or bruised by the lid falling shut. — “I have sold two of my high-end toy chests since we started selling them assembled a month ago,” Janet Gregory, owner of Over the Rainbow Toy Store in Anchorage, Alaska, told TDmonthly during a May 2009 survey of top-selling furniture. Made of weather-resistant wood and finished in a natural hue, this table set is intended to provide kids with a perfect place of their own. It may be used outside for snack time, homework, play or meals. The table comes with two matching benches with a storage area underneath to keep backpacks or playthings off the ground when not in use. The tall umbrella in the middle of the table provides shade for comfort and protection from the sun. — “KidKraft [sells best] for outside,” said Janet Gessner, owner of Deep River Toy Company in Deep River, Conn., during a May 2009 survey of furniture sales conducted by TDmonthly. — Three of 43 retailers said KidKraft is their best-selling brand of children's furniture. With classic decor against a subtle pastel color palette, this three-floor dollhouse include four open rooms, two staircases, a chandelier, a terrace and wide windows. It comes with 11 furniture pieces and is suitable for fashion dolls up to 11.5" tall. — “KidCraft always does well,” Kate Tanner, owner of Kidstop Toy & Book Store in Scottsdale, Ariz., told TDmonthly in June 2008. — “KidKraft — their big dollhouse for Barbie,” answered Jeanne McCullough, owner of Children’s Store Inc. in Boise, Idaho, when asked about best-selling furniture and playhouses. — More than 6 percent of retailers surveyed in June 2008 said dollhouses by KidKraft are good sellers in the category of playhouses and furniture. This bright red, wooden kitchen features a retro design and includes under-sink storage, a removable sink for cleanup, knobs that turn, and a microwave, refrigerator and freezer that open and close. It measures 33.75" x 11.75" x 36.5". — Patti Tepper-Rasmussen, owner of Learning Tree Toys, Games & Books in Oklahoma City, said she typically sells about one KidKraft kitchen per month, but sells about six around Christmas. — Three of 62 specialty retailers told TDmonthly in June 2008 that they carry kitchens by KidKraft when asked about best-selling furniture and playhouse items. 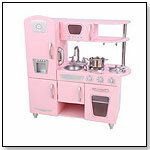 — KidKraft offers 16 different kitchens in various colors and sizes. 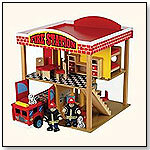 This set includes 22 pieces of furniture, three firefighters, an ambulance, a fire truck and a helicopter. It is four levels, counting the helicopter landing on top, and features a basketball court, a computer desk, bunk beds and more. The firehouse measures 30” L x 17.5” W x 25” H. Launch date: July 2008. The doll cottage is designed with a child’s imagination in mind. 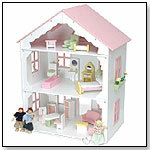 With open space to navigate and redecorate, this charming dollhouse offers hours of inventive play. Features include three levels, charming flowers and scalloped trim, rooms typical of any household, sturdy wood construction and a welcoming family of four dolls. The cottage measures 20" x 12" x 25" and weighs 20 lbs. — Dollhouses by KidKraft were predicted to be hot sellers during Christmas 2007 for girls aged 8 to 12, according to Lisa, manager of The Toy Box in Augusta, Ga.
— We sell a lot of wooden blocks and wooden doll houses by KidKraft,” Alison Cox, owner of Animal Quackers in Raleigh, N.C., told TDmonthly. — Four of 54 retailers cited KidKraft — especially their dollhouses — when discussing sales for the 2007 holiday season. Sometimes the little ones need a bit of a boost and a sense of independence, and the Flip Stool from KidKraft is up to the task. A classic piece of furniture, the Flip Stool is handsome, tough, versatile, and easy to clean and carry. It can also serve as a chair. This stool is 12” x 7” x 12” in dimension, weights 4.14 lbs, is available in white or natural colors, and comes in a larger version, too. — "The furniture of ours that’s probably the best [seller] is the step stool...from KidKraft," said Kristen Fennell, manager of Kids R Kids in Roxbury, MA, in the spring of 2007.